Hat Tip: My great little brother - Doctor Bradley B. One thing about this 2017 classic World Series is it had two special great baseball teams. The Dodgers led the majors with 104 wins and the Houston Astros had 101 wins during the regular season. The play and some of the great classic games in this series proved that these were the two best teams in baseball. It is said often, but this time it is really true, that it was a shame one of these teams had to lose. Congratulations to the 2017 World Series Champion Houston Astros, and all of the fans in Houston, who won their first World Series in the 56 year history of the organization. And congratulations to the storied Los Angeles Dodgers for their great season and making this World Series one for the ages. 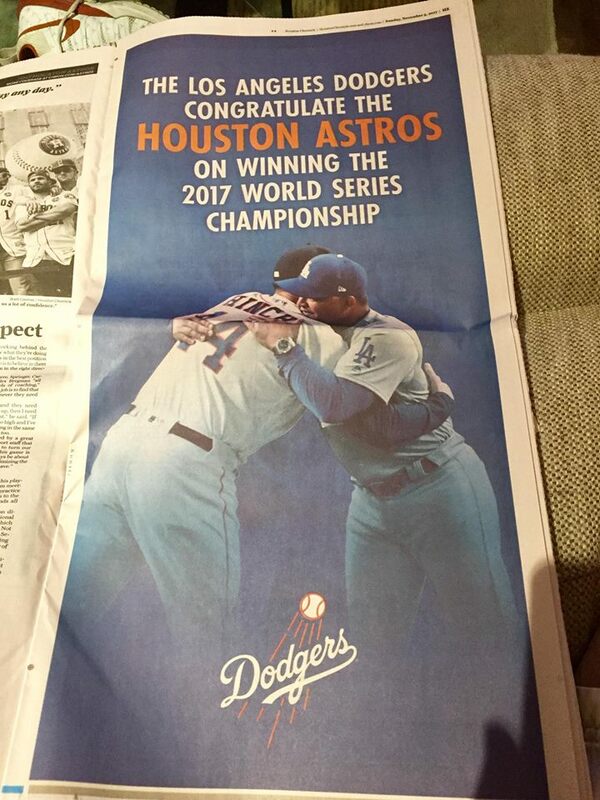 Once again congratulations to both the Los Angeles Dodgers and the Houston Astros and good luck for another great season in 2018.